I am late as usual with stuff like this, and considering I organized the SNAP event it’s kind of silly! I have two art shows coming up this Saturday, and they both will be on the First Saturday Art Crawl which means that you could park at one and ride the shuttle to the other, and also to other openings that night. (Nashville, TN) – The Connect 12 Artist Collective is pleased to present their exhibition at the Downtown Presbyterian Church, from November 1 through November 30. An opening reception for the group will be held on Saturday, November 1, from 6 – 9 p.m., in conjunction with the First Saturday Art Crawl. In addition, the group will hold two informal artist talks at the Church, at 1 p.m. on Saturday November 8 and on November 15. Ben Vitualla brought his peers together for the first Connect 12 show last September at Dangenart Gallery. The inaugural show not only brought critical acclaim for the collective of Nashville-based artists, but also served to inspire them each to produce better, more exploratory works of art. The simple philosophy of the group is to promote individual growth through exploration of craft and content. As diverse as the artists, so are their crafts, methods and statements. Viewers should expect the variety of media at this fall’s show to include interactive performances, fiber arts, photography, printmaking, sculpture, painting and mixed media. Content will range from reflections on the current political instabilities to explorations of the whimsy of coloring books. Many of the artists are continuing personal themes: Daniel Lai will showcase his familiar “creation by destruction” burnt art pieces, while Erika Johnson’s site-specific installation “Saved” will delve into the issues of financial crisis, (in)security, paranoia and poverty. Samantha Callahan’s work will continue to explore female body modification, and Shana Kohnstamm’s figurative paintings will deal with the human conditions of stress, fearlessness, and peace. Exhibiting artists include Alesandra Bellos, Jimi Benedict, Rick Bradley, Samantha Callahan, Eric Denton, Tiffany Denton, Chris Hill, Stacey Irvin, Sean Jewett, Erika Johnson, Shana Kohnstamm, Daniel Lai, Andee Rudloff and Ben Vitualla. 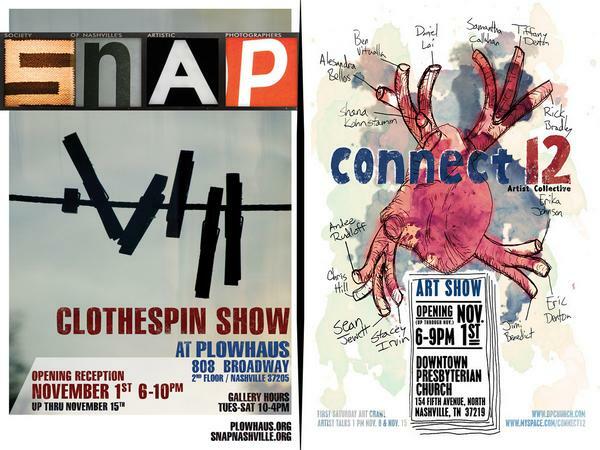 The Society of Nashville Artistic Photographers (SNAP) presents it’s the 4th Annual PUSHPIN/CLOTHESPIN Show. This gallery show will feature the work of 21 SNAP members who range from commercial and exhibition photographers to high end amateurs. Their unframed pieces will be on display and available for purchase at the Plowhaus Gallery beginning Saturday November 1st. Exhibitors include Eric Denton, Stefan Engstrom, Denny Adcock, Emily Naff, Nick Dantona, Shelly Santana, Kay Ramming, Jerry Atnip, Rebekah Pope, Barry Noland, Zak Willis, Wendy Whittemore, John Brassil, Jim Bruner, Jerry Park, Laura Carpenter, Brent Spears, Martha Smith, Erika Johnson, Pierre Vreyen and Al Levenson. Images range from traditional photo prints to archival inkjet prints to platinum/palladium prints. An opening reception will be held at the Plowhaus Gallery Saturday, November 1 from 6 to 10 PM. The Gallery is located on the second floor of the Tennessee Art League building at 808 Broadway, Nashville, TN. The exhibit will be open the following 2 Saturdays, November 8 and November 15 from 10 am to 4 pm. The Society for Nashville’s Artistic Photographers provides a forum for presenting and discussing member’s work in formal and informal settings. Members foster artistic growth through an open dialog of insightful criticism and feedback. The group will endorse and engage in local and regional photographic exhibitions and activities. We are dedicated to inspiring photographers and promoting photographic art in Nashville, Tennessee.